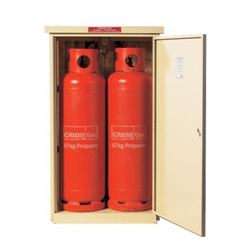 The Asgard Asgas 94 has been specially deigned to accommodate two 47kg propane gas bottles. Its 3x2 size ensures the perfect fit, and its steel construction keeps the bottles safe and secure. 1.2mm thick galvanised steel protects the contents, perfect for both domestic and industrial use on caravan sites, retreats, lodges, and rural settings.